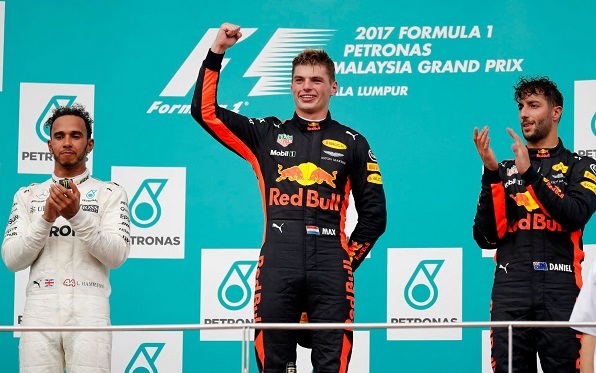 MAX Verstappen took his first victory of the Formula 1 season with a dominant drive in the final Malaysian GP, as Sebastian Vettel recovered from starting last to take fourth. 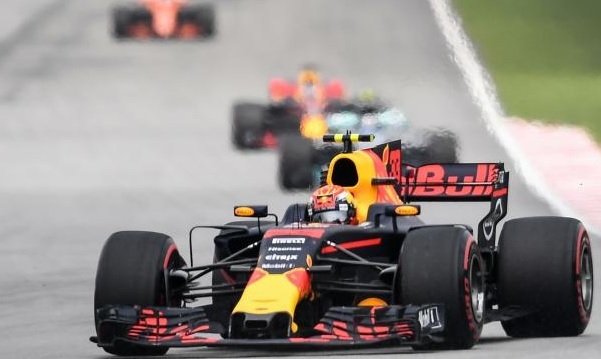 Red Bull�s Verstappen passed pole-sitter Lewis Hamilton into Turn 1 on lap four at Sepang and from there controlled the race to take the second win of his career. Hamilton finished 12.7 seconds adrift in second, with Red Bull�s Daniel Ricciardo completing the podium in third. Ferrari�s Vettel, running a new spec engine, hunted Ricciardo down in the closing laps, but had his challenge cooled when his team told him to back off because of concern over engine temperatures. There was drama for Ferrari before the start as Kimi Raikkonen, who was due to start second, suffered a turbo problem, and though the team tried to rectify it, it was unable to do so before the race began, forcing him into retirement. Hamilton got away cleanly from pole, with Verstappen holding off a fast-starting Valtteri Bottas to take second, and Ricciardo slotting into fourth. Verstappen then set about closing the gap to Hamilton and once he was in DRS range, the Red Bull driver was able to launch a move down the inside at Turn 1. His teammate Ricciardo hustled Bottas, getting alongside around the outside of Turn 1 and though the Finn held on around the outside of Turn 2 to get the place back, Ricciardo had the momentum to pass into Turn 4. Further back, Vettel was making strong progress, climbing up to 12th by lap two and eighth by the end of lap 11. Hamilton was the first of the frontrunners to pit for the first and only time at the end of lap 26, the Mercedes driver swapping super-softs for a fresh set of soft tyres. Race leader Verstappen reacted the next lap, taking the softs, too, and rejoining ahead of Hamilton. Ricciardo inherited the lead, but relinquished it to Verstappen, who led Hamilton by around nine seconds, when he pitted two laps later. 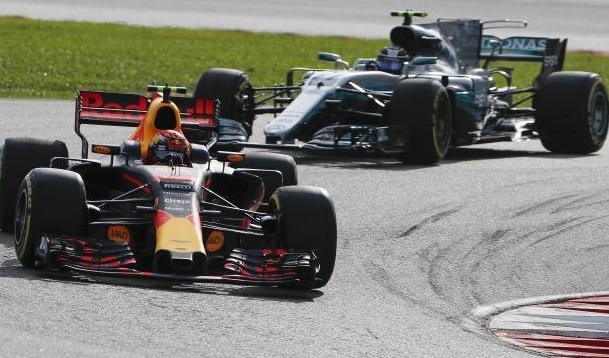 As Verstappen controlled the race out front, Ricciardo set about trying to catch Hamilton, but in the end the Mercedes was out of reach and Ricciardo had to focus on the threat from Vettel. Vettel got close enough to launch one attack into Turn 1, but Ricciardo slammed the door shut in front of him, and after that Vettel was forced to back off. Bottas finished a lonely fifth with Force India�s Sergio Perez having a clean race to take sixth. Stoffel Vandoorne made a strong start, rising up to fifth from seventh, but he did not have the pace to match Vettel and Perez and ended up seventh for the second successive race.